Dreaming of Red Mountains in Sedona + Surprise! There was always something so magical to me when it came to Sedona. I’ve lived in Tucson since 2009, and I’ve wanted to go to Sedona the entire time, but somehow I never made it up there. Now that I’ve been, I cannot recommend this beautiful town enough. By the way, I’ve got your Sedona itinerary sorted. We drove up from Tucson, which took us close to four hours since we wanted to take a longer route to have a more leisurely journey. The I-10 can be slightly nuts at times, so we opted not to be brought into that madness, especially during Rodeo Week. Once we arrived, we enjoyed the views. Seriously breath-taking. We checked in to The Sedona Rouge Hotel & Spa, which is a gorgeous 4 star resort. One thing I will note about Sedona is that there are a lot of B&Bs and inns, which are quite candidly, not my style. Upon check in, it was clear we were going to have a supremely cozy stay where we’d be totally taken care of each day. This definitely proved to be the case. As we checked into our room, I was blown away by the décor through the room. It had such a gorgeous layout, but brought that burgundy and red branding seen throughout Sedona, inside the room. The bathroom was gorgeous, and the shower could fit 10 people in it, which is the perfect amount of space for me, myself and I (ha!) Not to mention there was a shower head directly above one and then me in front so I could have both turned on to get the maximal water pressure during my shower. That first evening we went to Elote Café, opened by the wonderful Chef Jeff Smedsted. This is the restaurant in Sedona that people line up outside 30-45 minutes before it opens (open 5-9 PM most evenings.) The concept is built on Mexican food, Oaxaca style. Their signature appetizer features fire-roasted corn. We ordered goat cheese balls and guacamole initially. This guac was so good; I honestly couldn’t stop eating it the entire night. Even when I got super full later, I was still picking at it and wanted to eat more. After these appetizers, we were told we had to try the corn chili dip because it was the signature. Needless to say, it was delicious. I am still thinking about all of these appetizers – best cheese balls ever by the way. The outside was fried, breaded to perfection, and the cheese just melted once you bit in to the ball. 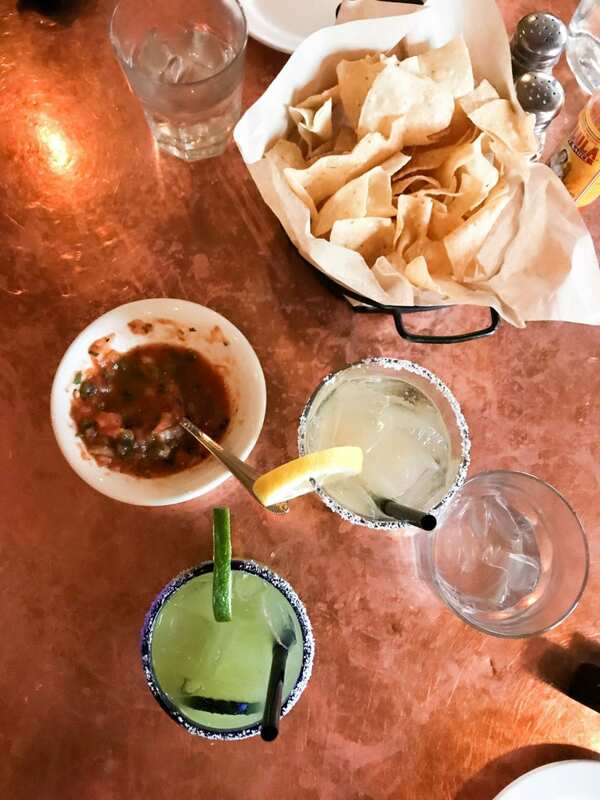 We had delicious margaritas with some of the rarest tequilas, and every margarita tasted completely different. When it came to a sipping drink, we were brought a delicious mezcal, which had the perfect smokiness and oakiness to it. These are two of my favorite characteristics to a scotch, so I loved getting similar notes from a mezcal. After all the appetizers and cocktails, we finally decided to order a dinner. Because we were so stuffed at that point, we decided to split an entrée. I was initially going to go with the brisket (because I love brisket!) but decided to get more adventurous, so we shared the buffalo mole. So glad I got out of my comfort zone, and did buffalo because it was truly so delicious. What an incredibly delicious dinner, and after the good times (we were there three hours!) we headed home to our gorgeous Almeria king room in The Sedona Rouge Hotel & Spa. 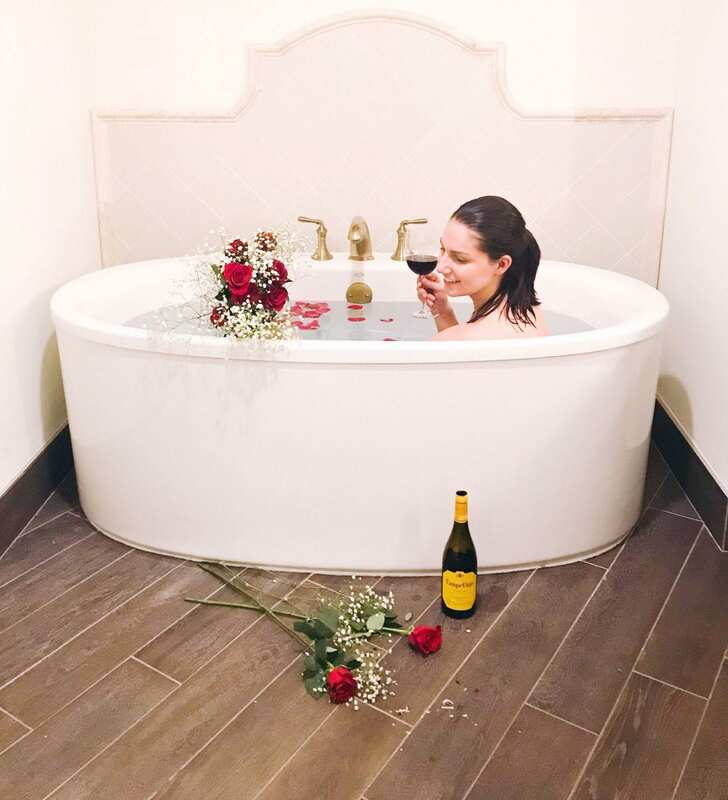 Because I didn't want the fun to end, I decided to go to the Safeway (right next door) to grab some roses, the hotel brought us some wine and I did a little photoshoot in the gorgeous floating tub. There's something so dreamy about a nice floating tub, and this one was particularly comfortable with plenty of room for me. Dreamy right? The next day, I started my morning off with a facial at the gorgeous spa at The Sedona Rouge Hotel & Spa. Not only was it extremely relaxing, it was genuinely the best facial I've ever received. The products were fabulous, in particular Emergin C, which I found to be an incredible brand I'd like to try more in my day to day. After my facial, Aaron was super excited for a mini road trip within our road trip. We drove to Flagstaff to grab some brunch...on the way to the Petrified National Forest. This is something Aaron has been super interested in seeing for several months, so I was glad to finally make it happen! This is not the typical forest you'd expect with trees and greenery all around. This is quite literally the opposite, but so cool due to the petrified nature of everything. The tree trunks, mountains and everything within the forest are so incredibly old making this super cool. 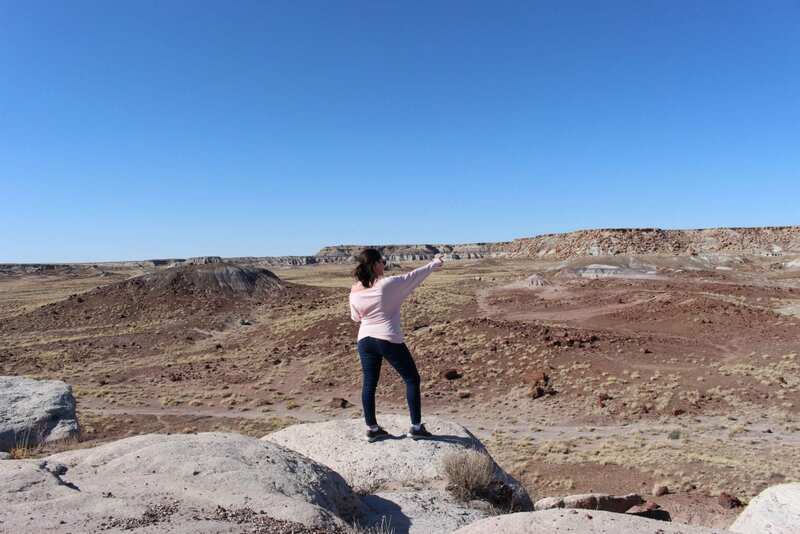 When it came to the Petrified Forest, it was pretty exciting for me, given everyone told me not to get too excited about it because it was an "old desert," It was so much more than that. Between all the history, there's a lot to learn and understand about our planet. I loved the visitors center, and reading about various eras of the park to understand just how much had happened there. Definitely a unique experience that makes you feel so small in the grand scheme of things. 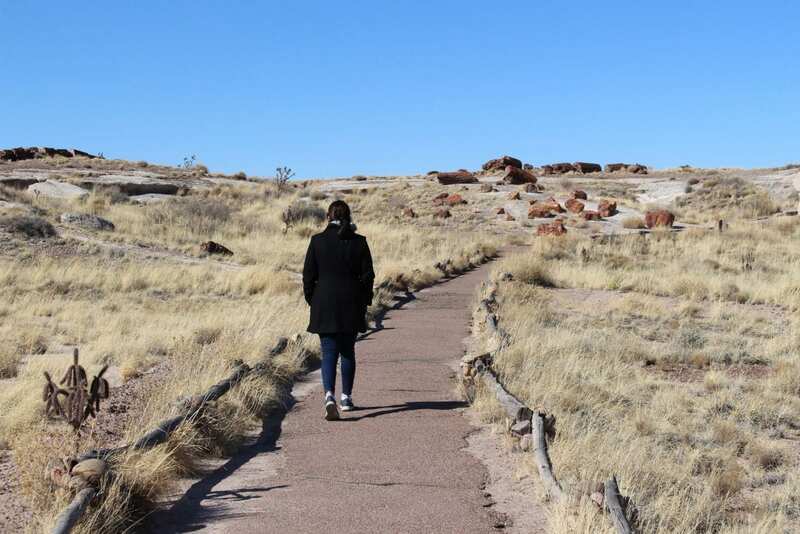 Once we left the Petrified Forest, we headed back to Sedona for our dinner reservation at REDS. This was such a fine dining experience, from the moment we walked in the door. The hostess greeted us so cheerfully, and told us a beautiful story about her husband and her. She was so conversational and genuine. You can usually tell when someone is being genuine, and I love that characteristic about people. 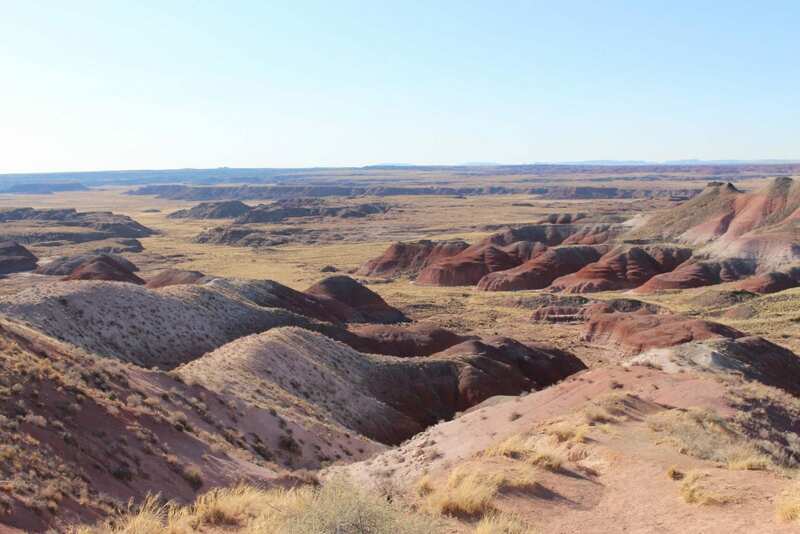 Once we left the Petrified Forest, we headed back to the hotel because we had dinner reservations at REDS. This is a fine dining restaurant part of The Sedona Rouge Hotel & Spa. It was so relaxed and the ambiance was excellent inside. Not to mention it got us out of the chilly weather quickly, since the temperatures were dropping quickly. From the moment we walked in, we were taken care of by the entire staff. Our hostess was so kind, and told us the sweetest story about her husband. When we choose which table we preferred, one of the servers came over and cleaned the table off. Our server was attentive the entire meal, refilling waters quickly, making excellent recommendations and being pleasant the entire time. I cannot recommend Sedona Rouge enough, given the incredible accommodations (loved the Almeria king room), the spa and RED Restaurant. So much to do in one gorgeous spot. We stayed in the building in the back and it was peaceful with gorgeous views of the mountains. If you have recommendations for a future trip to Sedona, definitely let me know in the comments. Questions for me about this trip? Feel free to DM on Instagram. 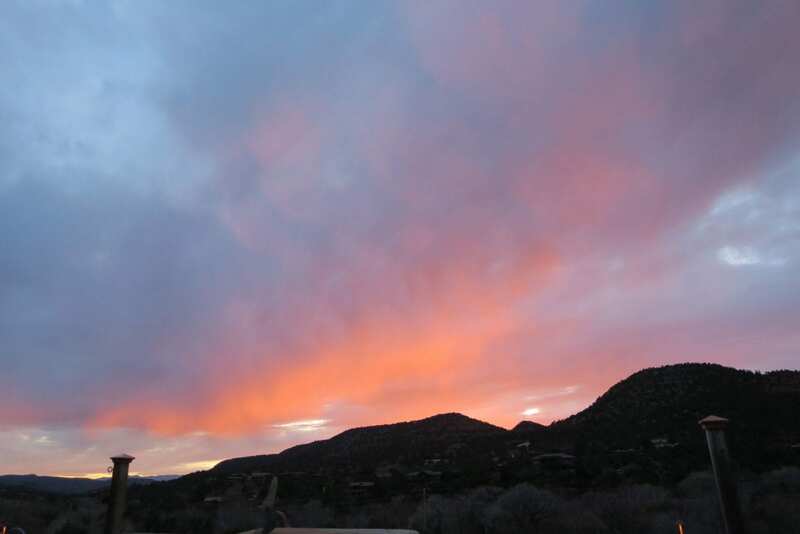 Have you had the pleasure of experiencing Sedona's charm?